Today is World Elephant Day around the world, a day to recognize and celebrate these incredible animals. Many people are aware and rightfully outraged about the grave situation happening with poaching Elephants for their ivory. But it’s unfortunate that many people remain uneducated about the miserable situation of Elephants used in the tourist industry. Speaking from personal experience, I have seen the conditions in which these beautiful creatures are living and how dismally they are treated. 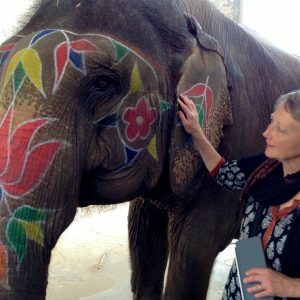 I’m speaking specifically about India, where I volunteered for a week at the Elephant Village outside of Jaipur. These Elephants are used primarily to carry tourists up to the Amer (Amber) Fort. What the average person doesn’t see (or know) is that for the most part, these Elephants are housed in concrete bunkers, unable to see or have any contact with other Ellies. These are social animals. They are chained, with their front 2 legs together and one back leg is also chained. They are regularly hit and yelled at to keep them intimidated. Their food consists primarily of sugar cane and some chapatis, made from chickpea flour. Some of these Ellies have health issues such as open sores and a few are blind. One that I worked with was “weaving”, swaying back and forth. The mahout said she was “dancing”. This is a clear sign of a stressed Elephant. Most of these Ellies have tattered ears and are pricked with a sharp stick or bullhook in order to raise their trunks for tourist pictures. Some have been retired from circuses, others taken from the jungle at a young age. To prepare them for the day of carrying tourists up to the Amer Fort, which is on a very high hill, they have a heavy blanket put on their backs. Then a steel frame, weighing at least 100 kg is strapped around their bodies. More blankets are put on these frames. The tourists sit on these frames. A fully-grown elephant can carry up to 150 kilograms; add up the weight of the blankets, the chair and tourists. The weight far exceeds 150kg. This is their life, day in, day out. As long as tourists continue to take these rides, they will continue. If people were to become more aware and considered what is happening behind the scenes, many would choose to forgo that photo op. I will never understand how an Elephant can be considered a sacred animal and yet treated in such appalling ways. The following year, I volunteered, again for a week, at Elephant Nature Park, outside of Chiang Mai, in Thailand. What a world of difference! Here the Ellies have a huge acreage to roam on and a river to swim in. 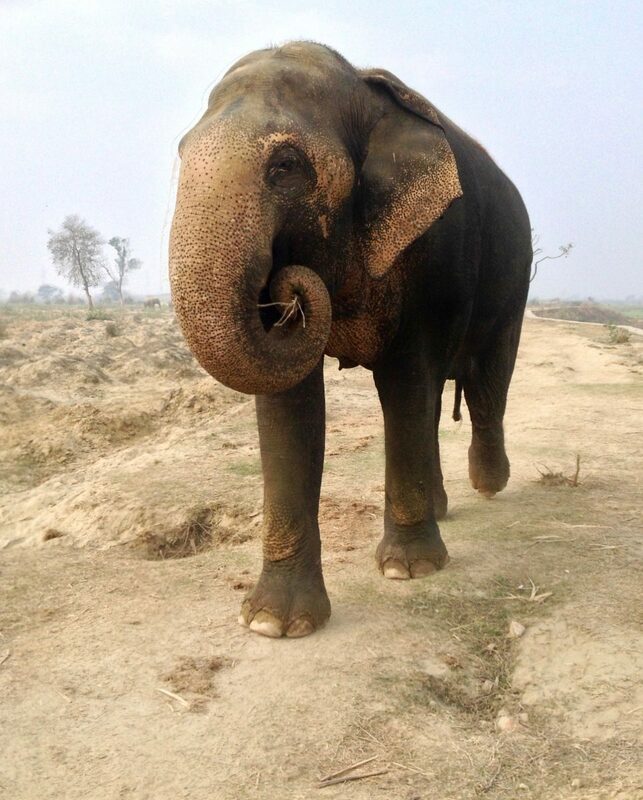 Each Ellie has a mahout, who walks with them, cares for them. They are treated kindly, with love and respect, not with force or violence. Volunteers do a variety of things for the Ellies. They unload food trucks, wash the food before it’s chopped up, clean out their stalls, cut corn stalks, clean the water buffalo fields. They also build gardens, walk with the Ellies, shower them with bucketfuls of water while they’re in the river. These are a few of the jobs, that we did. The Ellies are free to roam and they have formed family groups. They are never chained, beaten or intimidated. For this privilege of spending time with them, I paid to volunteer, just as I paid to volunteer in India. I wish for the Ellies in India to have a similar future as in Thailand. If it can work there, it could work in India also.